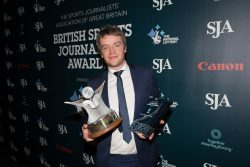 Daniel Taylor, chief football writer for the Guardian and the Observer, was named Sports Writer of the Year at the SJA 2017 British Sports Journalism awards. Taylor also took the Football Journalist of the Year accolade, an award sponsored by UEFA Together #WePlayStrong. He had previously won that category in 2015 and 2016. Richard Conway, of BBC Sports News, was named Broadcast Journalist of the Year, while the BBC’s Mark Chapman won the Broadcast Sports Presenter category. The Sun’s Richard Pelham took the award of SJA Sports Photographer of the Year, sponsored by Canon. The Doug Gardner Award, which honours a member of the SJA who has made an outstanding contribution to sports journalism and the Association, went to the SJA’s former chair David Walker. The awards were presented at a gala dinner staged at the Park Plaza Westminster Bridge, hosted by Jim Rosenthal. Sponsored by the National Lottery, the awards were attended by more than 500 guests including 16 places given by the National Lottery to next-generation journalists.